A new era has come! Cart2Cart is excited to announce that the migration to Magento 2 is now available for everyone willing to seize the most progressive e-Commerce platform yet existing! 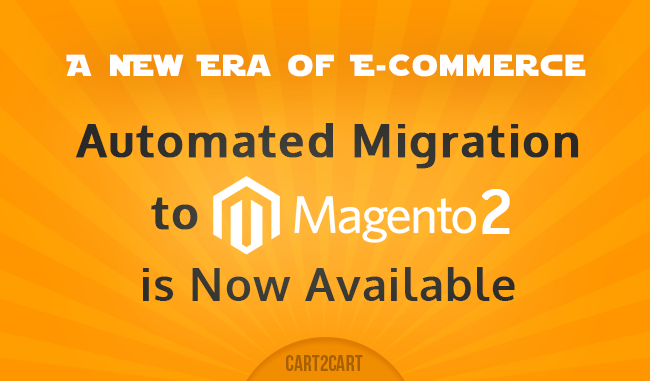 From now, you can perform an automated migration to Magento 2 from nearly 70 most popular shipping carts in an unprecedented ease. Now, the best part about all that is that you’re just in a single step from obtaining all the precious platform enhancements! Simply upgrade Magento 1.x to Magento 2 by performing a seamless migration using Cart2Cart! So, what does it take to migrate to Magento 2? Just a few hours of time if using Cart2Cart - no programming skills required! Simply install Magento 2, register Cart2Cart account, establish a connection between the stores and get it rolling! Start with an absolutely FREE Demo migration and check out how everything works in terms of 30 min!